Danielle joins our team as a recent college graduate from Drake University where she majored in Marketing and Entrepreneurial Management. Her knowledge of targeted marketing strategies will allow the team to reach and meet the needs of a variety of different client bases. Danielle Also works closely with other members of the team by helping them with open houses, agent accountability, and serving as our Director of First Impressions. Jessica has worked in the real estate business for six years as an Escrow Closer. She is now working on the real estate side as a Licensed Realtor and Director of Operations for Theobald Realty Group powered by Keller Williams. She coordinates everything behind the scenes to guarantee that every client and every listing is getting the attention they deserve. She is there to answer any questions along the way and will take you from the day of contract to the day of closing and ensure you are satisfied with every aspect of your transition! After a number of years working in and around the Real Estate market, Leslie decided to focus her energy into the one thing she loves most, finding the perfect home for her clients. She enjoys helping them to see the full potential of a home and all the possible ways to make it the most comfortable place it can be. Her background includes almost 10 years in Property Management, consumer sales positions, building a Home Organizing business and 5 years in the Custom Closet Design field. She prides herself on earning the trust of her clients and helping them to get home. Korrie found her housing niche in landscape design. For 7 years she designed and sold both residential and commercial landscaping in the St. Charles and St. Louis area. Korrie enjoyed her experiences with the homeowners and decided to make a career change. As a Buyer Specialist, Korrie now focuses all her energy on Real Estate. She loves that she gets to find her clients the Home of their Dreams! She loves using her knowledge of landscape design and passion for architecture to help her clients envision the changes they want in their new home! After 30 years of designing, developing, and operating her own business Vel joins Theobald Group to start her next career in Real Estate. With a background of working with clients for interior decorating and designing furniture layouts in luxury homes, Vel is excited to apply her skills in the Real Estate world. Not only had she built the Green Door Day Spa, in Frontenac, from the ground up but Vel has been able to design and furnish multiple other local spas and businesses in the St. Louis Area. From living in both St. Louis County and St. Charles County, Vel is able to assist clients from all over our region due to her extensive knowledge of living in so many different areas. Vel is ecstatic to start her next entrepreneurial venture with us! Nicole has come to our team with over 11 years experience in customer service and 5 years in sales and marketing. Also, coming from the healthcare field, her skills allow her to provide exceptional communication to our clients, the ability to understand what is important to our clients, and helping them in every possible way. Her main focus is to assist our clients throughout the listing process. She will be there every step of the way from making sure your home is ready to sell to getting you under contract. She is happy to be a part of a great team! Megan is the newest addition to our ever growing team. With having 10 years of experience in customer service she was the best choice for Theobald Realty Group, as Transaction Coordinator. Her real estate career began when she was hired to be the Director of First Impressions at Keller Williams Realty West. Megan was soon presented with many opportunities to further her career. She began with becoming a licensed realtor and soon after joined Theobald Realty Group. As Transaction Coordinator, she will take you from the day of contact to your closing day ensuring you are satisfied with every aspect of your transaction! Erin has 5 years experience within the property management industry. She grew up in St. Charles County and knows the area very well. Theobald Group prides themselves in being a one stop shop to make your real estate experience a stress free transaction. 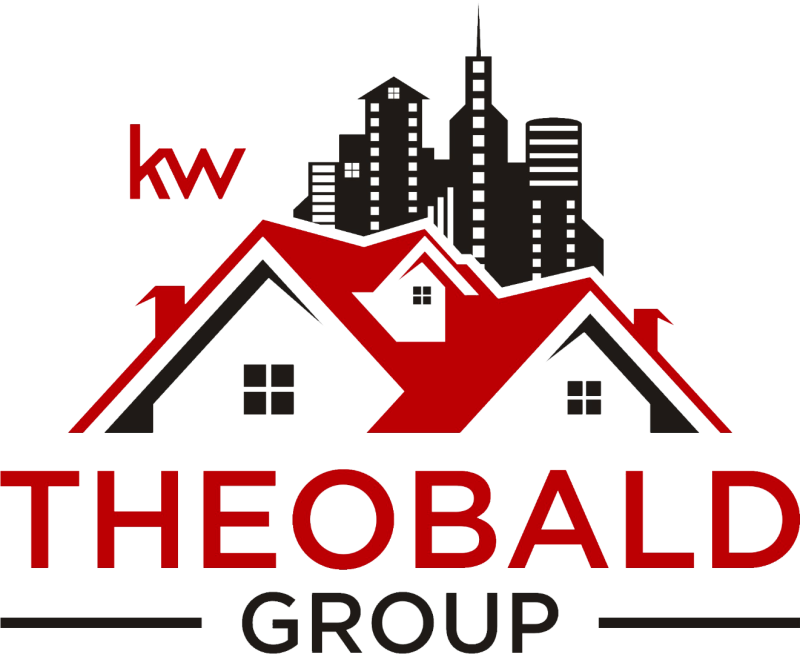 Theobald Group was in the Top 2 Teams in Keller Williams in 2012, 2013, 2014, 2015, and 2016! Erin looks forward to helping families and individuals find a place to love and call home! After graduating with a bachelor’s degree in Criminal Justice from SEMO, and serving 4 years as a Police Officer for the St. Louis County Police Department, Catie joins Theobald Group team as a buyer specialist! Catie is a huge sports fan. If she isn’t watching her favorite teams in the MLB, she is enjoying the NBA. She is very excited about starting her new career in Real Estate, and is ready to help you find your first, next, or forever home! Kyle joins Theobald Group after 17 years in the business world. He has been able to gain experience through business management. With the help of his previous profession, Kyle is able to bring his customer service skills to the Real Estate industry. He enjoys helping people with their needs and making their home buying experience enjoyable. All the way from start to finish and even after. Being a St. Louis native, Kyle is a sports enthusiast. His favorite teams are the Cardinals and the Blues. Being a proud father, Kyle is a very family oriented person. He looks forward to using his skills and expertise to help his clients' transactions go as smooth as possible and to help them make new memories! Jennipher joins Theobald Group after 10 years in the cosmetology world to start her Real Estate career. She is also involved in Clippers for Christ! With her customer service background, Jennipher is excited and looks forward to building new relationships. Being in a customer based industry in cosmetology, she is passionate about being able to use her previous customer service and sales background moving forward to help you find the perfect home and have the best experience doing so. Jennipher is excited to be able to build better foundations with her community and charities! As a new member of the team Ryan has a wealth of experience regarding home construction. Ryan has lived in the St. Louis area for 36 years. For the past 20 years, he has been working in the construction industry and has intricate knowledge of the construction process. He now has decided to transition to the real estate world to connect more with others and help those with real estate needs. Ryan enjoys trying new restaurants throughout the St. Louis Area and seeing new places such as national parks. When Ryan isn't working he is out trying to find new roads to ride his motorcycle. Ryan looks forward to helping you with all your real estate needs. Joe has been in the building industry for over 16 years helping clients in various roles. He has been a lifelong resident of the St. Louis area and can't see himself living anywhere else. Joe is excited to be a part of an established real estate team that has a proven track record of taking care of their clients and providing great customer service. When Joe isn't busy helping clients he is usually at home reading a good book or barbecuing. In a booming housing market, Clarence was a foreman for a large residential plumbing company. When the housing market changed, he saw an opportunity in a different direction and repositioned himself in real estate. Over the past few years, Clarence has worked with buyers and investors utilizing his extensive contracting experience to ensure his clients are knowledgeable about the condition of their future home or investment purchase.